This 8-week training program is sport-specifically designed to prepare experienced, advanced alpine climbers/athletes for multi day/week technical alpine-style, mixed/ice mountaineering expeditions in the Canadian Rockies, Alaska, Himalaya, etc. 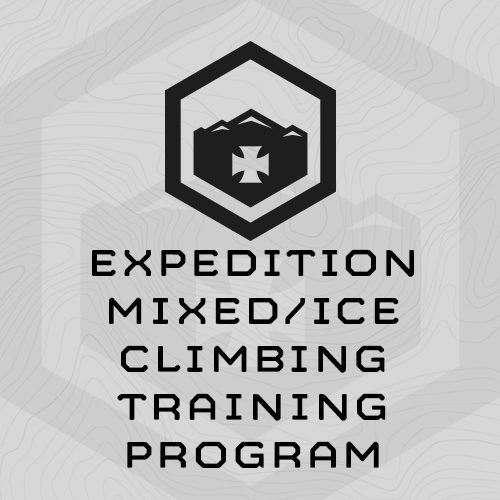 This is a very intense, progressive program, and assumes athletes advanced enough to plan dangerous alpine mixed/ice climbing expeditions are already very fit. This training methodology is the same we use with our professional mountain guides and sponsored alpine climbers including Patagonia Ambassador Ben Gilmore for his 2010 attempt on Nupste. – Strengthen your legs and lungs for miles and thousands of vertical feet you’ll be hiking up and down during your climbing trip. – Build your core/midsection strength and overall strength so your body will be able to perform well with a loaded backpack, and be able to recover from long days in the mountains. – Train your “sport specific” ice/mixed climbing grip, core and calf strength, work capacity and stamina. We train your sport specific grip strength by having you hang and do intervals using your ice tools on a system board. The minimum sized system board you’ll need is a 4×8 sheet of plywood set at a 15 degree angle. You can use common rock climbing holds with your tools, and also hardware such as old door hinges, door bolt brackets, eye bolts, etc. We use all. While one 4×8 sheet of plywood is the minimum you’ll need to complete this program, space and cost allowing, we’d recommend you build up to 4 system boards placed close enough that you can move from one to the other without touching the floor. You’ll be spending hours hanging on your system boards. This is very effective training, but pure drudgery. The more system boards you have the more variety you’ll have for movement … and the training will be more interesting. You’ll also need a pull up bar, door frame, overhead floor or roof joist, eye bolts in the ceiling, etc. to do dead hangs on and Figure 4‘s using your ice tools. 4x Mr. Spectacular - increase load until 4x is hard, but doable, then immediately ….